The Azerbaijani Armed Forces have replenished their arsenals with Israeli Sky Striker fully autonomous loitering munitions systems capable of long-range precise tactical strikes manufactured by Elbit Systems, the online portal bmpd reported on January 11. The drone-kamikaze is a small unmanned aerial vehicle with a pushing propeller and an electric motor. Its weight is 35 kg, and combat units of various purposes weigh from five to 10 kg. Sky Striker differs from its analogues by electrical engines which makes no sound.The speed of UAV – 185 kmph and endurance is 2 hours. Kamikadze strikes the aim with the speed of 300 knts. Sky Striker can be airborne for up to two hours. The operator’s managing drone can direct it to the target almost to contact with it with the ability to cancel the attack. If during the flight it was not possible to find a decent target, the UAV can go back and sink to the ground with the help of a parachute. Drone can attack the target at different angles. Azerbaijan is the first foreign operator of Sky Striker. As per now, the country uses “Harop” loitering munitions of IAI company. 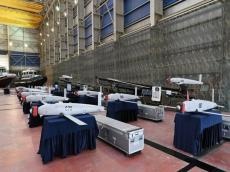 There are already small shock disposable UAVs Harop of the company Israel Aerospace Industries (IAI) and Orbiter 1K (Z?rb?-K) of the company Aeronautics Defense Systems (ADS) in the armament of the Azerbaijani army. At the same time, Orbiter 1K (Z?rb?-K) was demonstratively used on the contact line, and IAI Harop kamikaze drones were used during the April fights in Nagorno-Karabakh. Orbiter 1K ammunition has a take-off weight of about 11 kg, a warhead weight of 2.5 kg and a flight duration of up to 3.5 hours. Harop devices have a take-off weight of 135 kg, a warhead weight of 23 kg, a flight duration of up to six hours. In contrast to the IAI Harop, the Sky Striker and ADS Orbiter 1K barrage munitions are almost silent as they are driven by electric motors. Over the past decade, Israel officially sold Baku a wide range of lethal and non-lethal weapons - from small arms, armored vehicles, mortars to various types of unmanned aerial vehicles, radar and air defence systems, as well as rocket artillery systems. To a certain extent, this cooperation has also evolved - some weapons systems, originally acquired by Baku, are now being produced independently in accordance with licenses issued by the Israeli military industry.